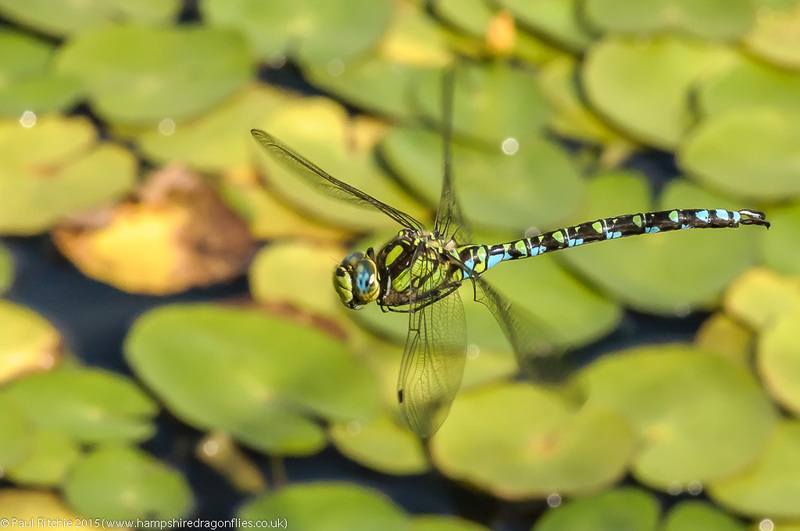 I had an itch which needed scratching; to find a pond with a patrolling Southern Hawker. Firstly, I needed to find a pond with water; the all-too-brief showers we’ve experienced (up until this point) hadn’t been enough to curtail, let alone reverse, the decline in our water levels. I had just the pond in mind; not too far, reasonably sheltered and hopefully with enough surrounding activity to provide enough opportunities should my wish be unfulfilled. 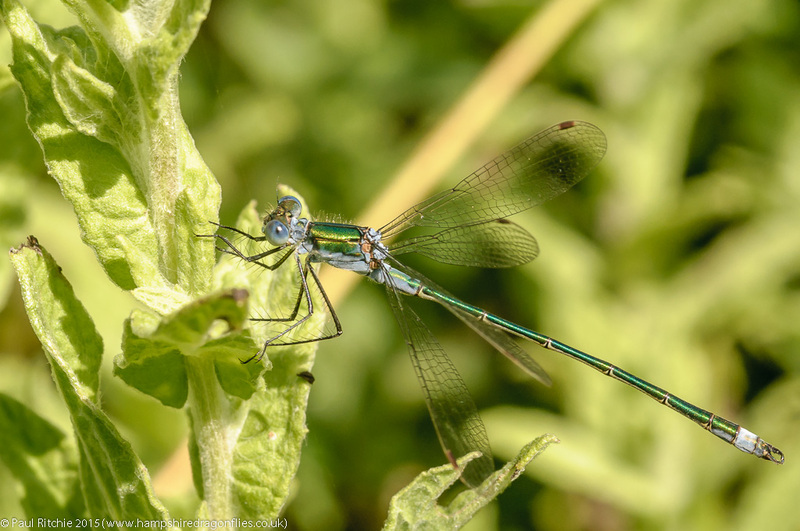 Thankfully these opportunities were borne out by a very good showing of Common Emeralds both along the shore and in the surrounding meadow. We had to wait for any decent spells of sunshine to kick-start some over-water activity, so I busied myself around the margins. 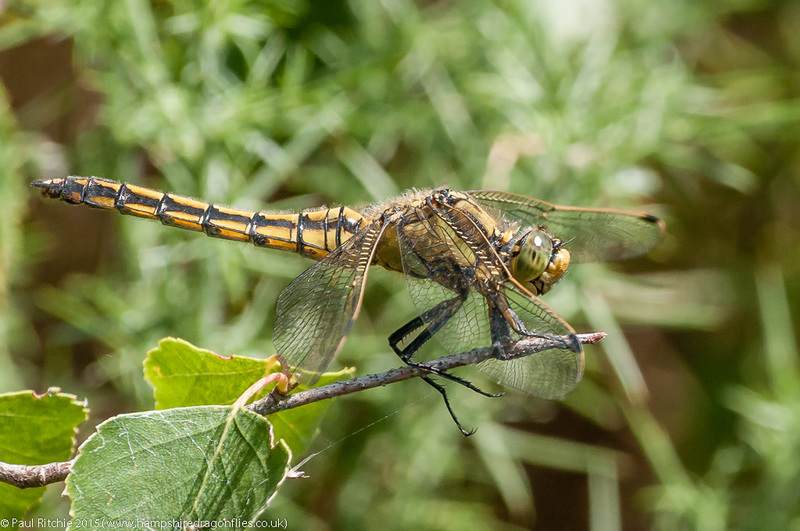 An old and tattered Four-spotted Chaser was hanging on in there, holding his own against a few maturing Common Darters. 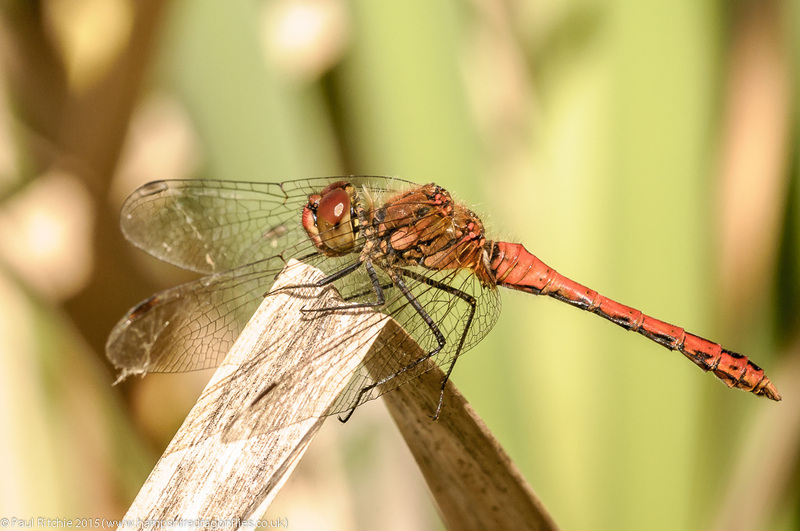 My attention was grabbed by another darter, this one noticeably smaller and a much deeper red. 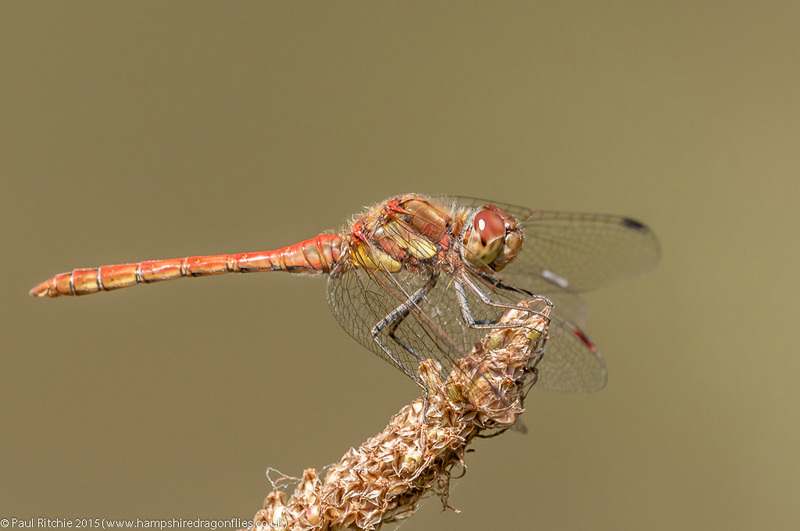 A bonus finding Ruddy Darter here, their being rather local, and usually only in small populations in the New Forest – in stark contrast to the swarms found around the Thames Estuary. Finding a reasonably local guaranteed population other than Badminston or Keyhaven is something to be celebrated. Turning our attention to the skies we noticed a substantial break in the clouds approaching, certainly enough to wake up the pond. Sure enough, after five minutes the first male Emperor appeared, followed by a female and another male, making for some natural aggression. The winning male failed in his attempts to lure the female away from ovipositing, so he decided to pick on another. He lost, and skulked away to the other side of the pond while I proceeded to enjoy his victor’s presence and indulge in some in-flight opportunities. He stayed close and very low above the Lilies, weaving in and out in a youthful display of dexterity, which along with the obscuring bank-side vegetation made for some challenging captures. Just what I hoped for, and just what I needed! 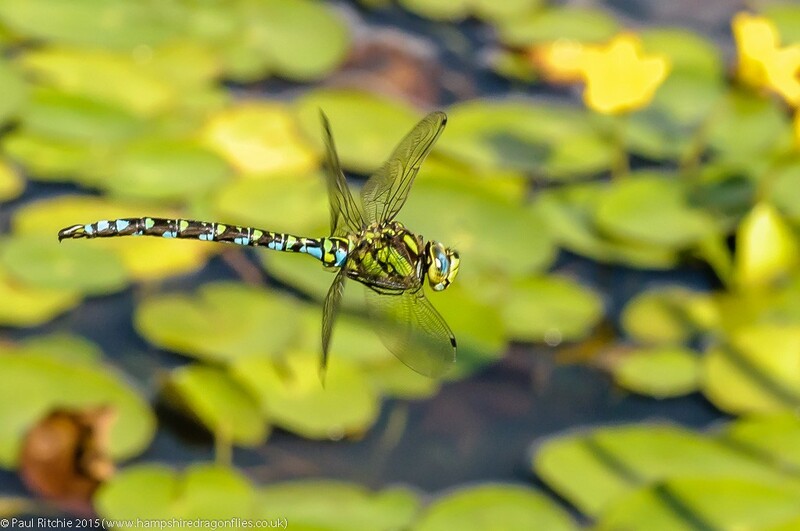 Where are the dragonflies? The butterflies seemed to be in their element. Bees, Flies, Beetles etc all enjoying the warm breeze. Ideal time for hunting & feeding, you would have thought? At Pennington a light blanket of cloud wasn’t going to provide anything over-water, but the surrounding foliage should have been buzzing. Unfortunately not the case. Very few damsels. 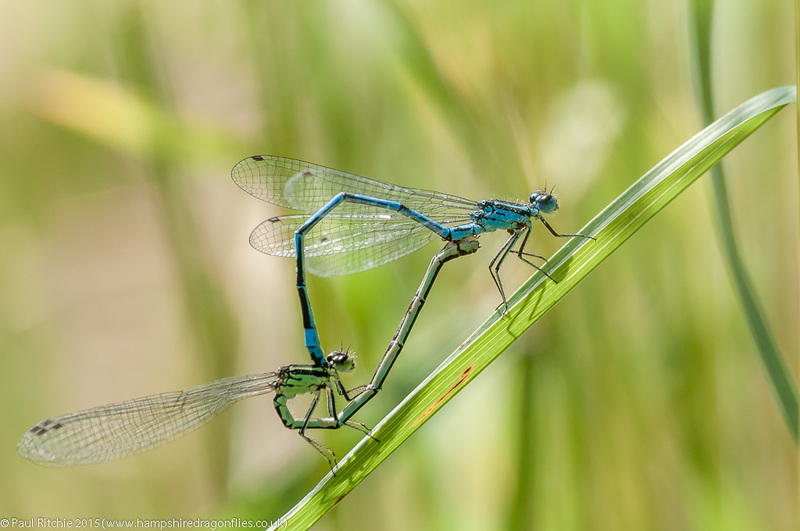 The Demoiselles were letting the breeze take them as if they didn’t care where they ended up. 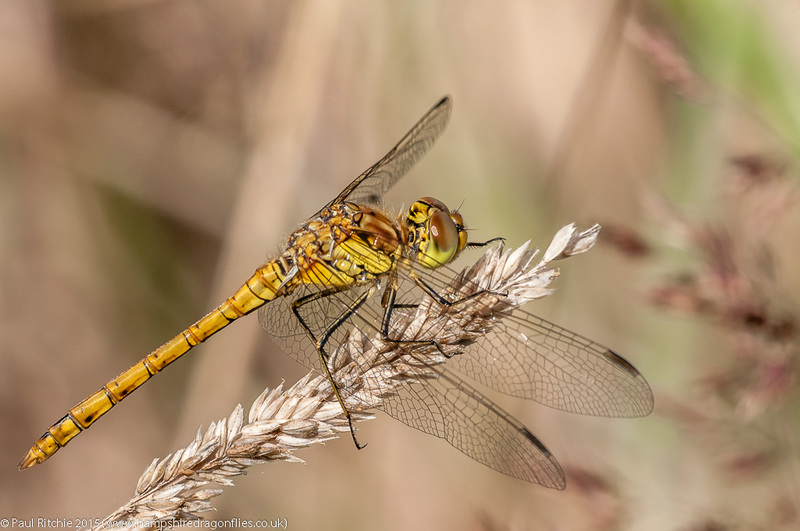 The (very) occasional teneral Common Darter rising, no Black-tailed Skimmers – normally hardy – to be seen. 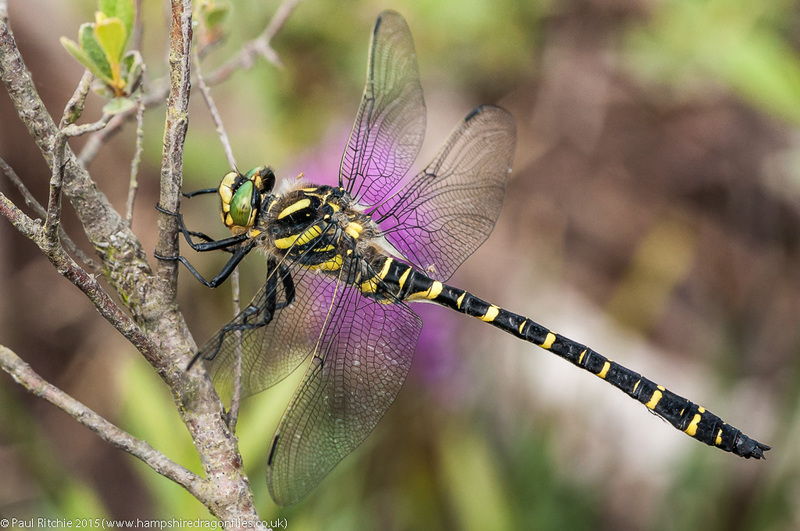 No Emperors – not even a female ovipositing in the peace. 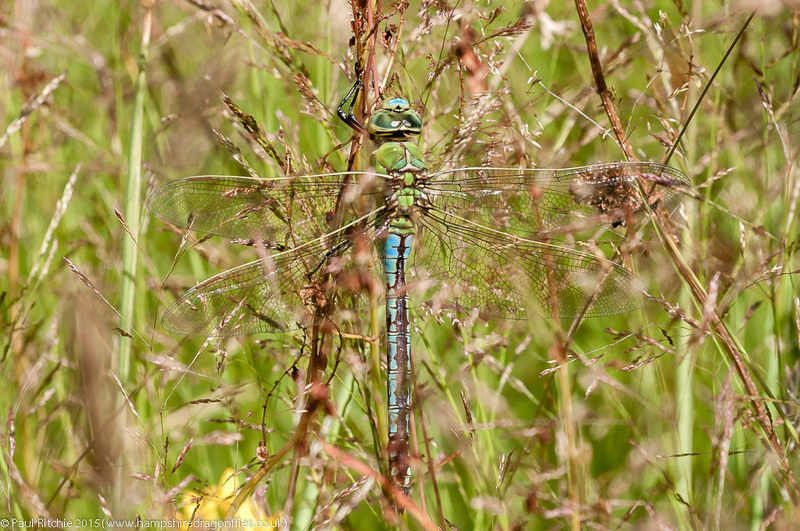 Even the rides – irritatingly overgrown – where devoid of the usual basking Common Darters or maturing Hawkers. Yet the butterflies were plentiful and were seemingly enjoying themselves. On to Crockford then. Surely the shelter would reveal a few treasures? Sadly not. No Hawkers, Chasers, Skimmers or Darters around the margins on the way in, and only a female Keeled in the heather around the basin. 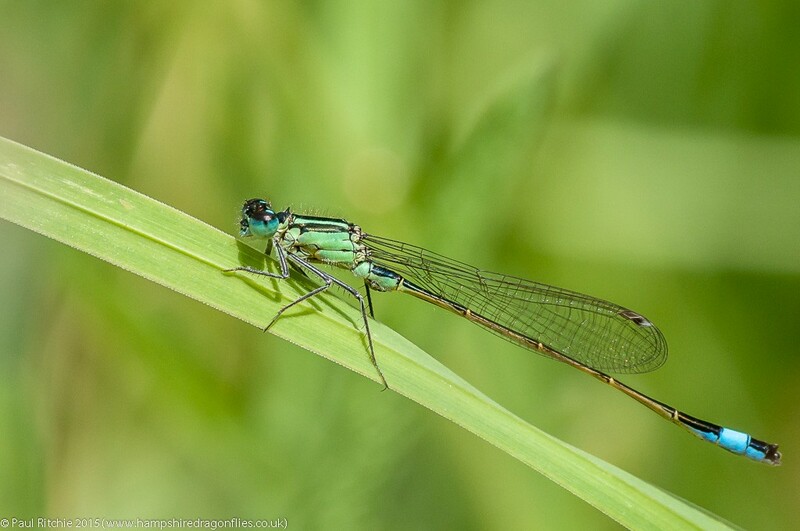 The walk upstream did produce a few Beautiful Demoiselles, Small Red and Southern Damselflies, but not one Golden-ringed. I’ve often stated that if you can’t photograph a Golden-ringed at Crockford then you might as well give up! Of course the statement does require their presence. At 1.30pm the sun made a brief appearance; enough to delay my leaving and give it another shot. 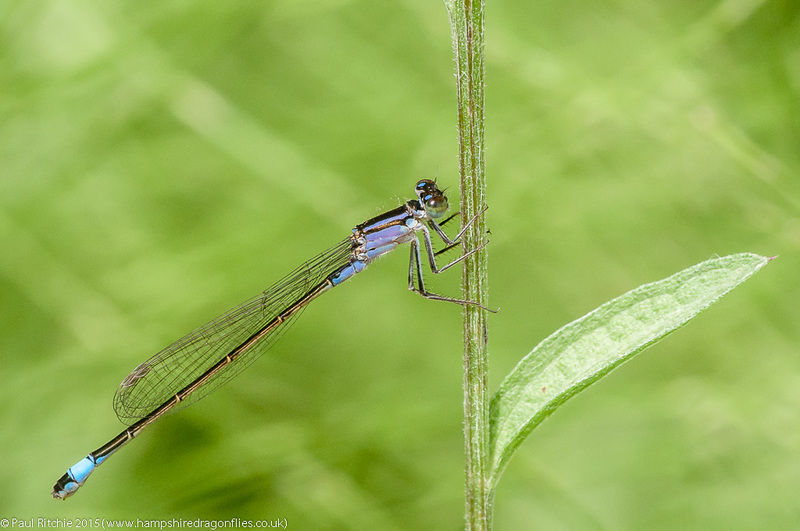 A few Southern Damselflies braved the water for all of fifteen minutes until the cloud rolled in again. There were pockets of blue sky surrounding this barrel of gloom. Perhaps another location might bring forth results, so I decided to try Badminston as a last resort. The drive over saw sunshine, but by the time I arrived the cloud arrived again. 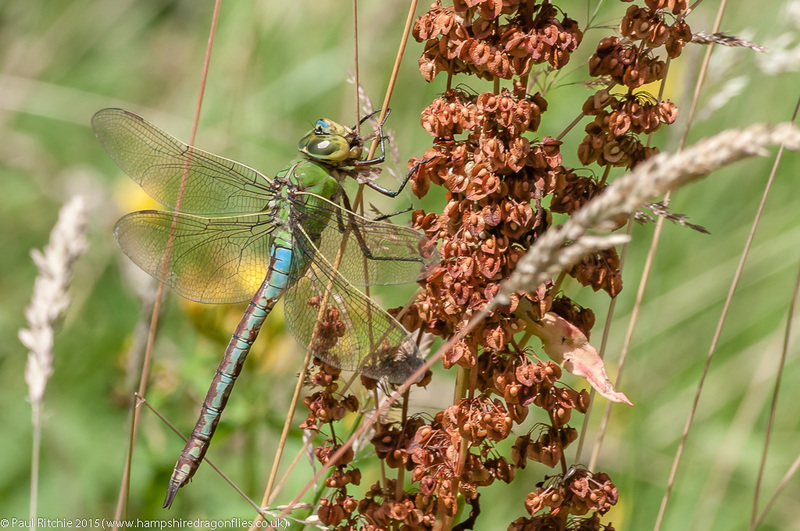 At least there were some Black-tailed Skimmers here; seeking solace in the grasses along with the occasional Emperor, Common Darter and ever-present Common Blue Damselflies. 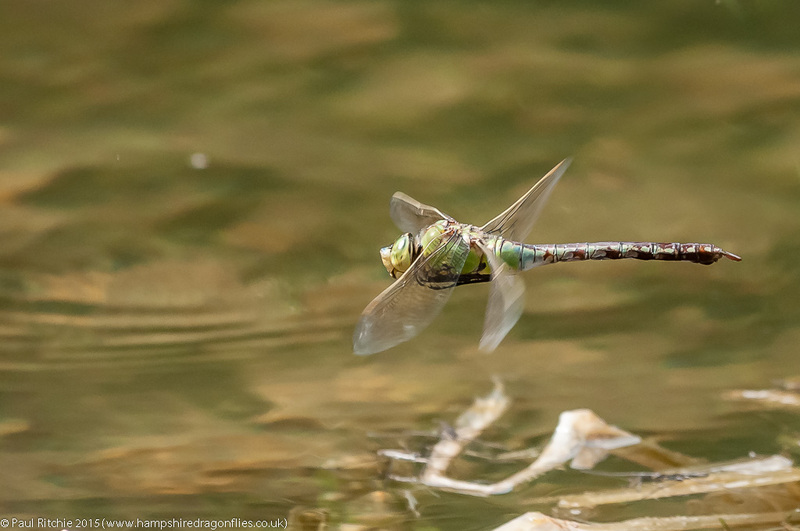 The heavily-reeded section of the original pool had the best water display I’d seen all day, with several damsels acting naturally, a brief passing Emperor, more Common Darters and some obliging Ruddy. There were also plenty of Common Darters hiding out in the grassy corner. 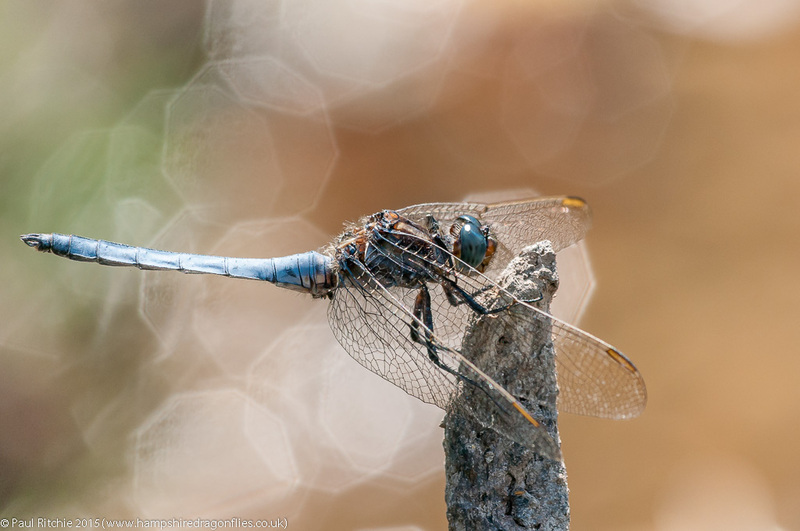 I did have a brief glimpse of a Southern along hawker alley, and back at the lake the reappearance of the sun had brought forth a little action over the water, with a couple of male and a female Emperor and some Black-tailed Skimmers. 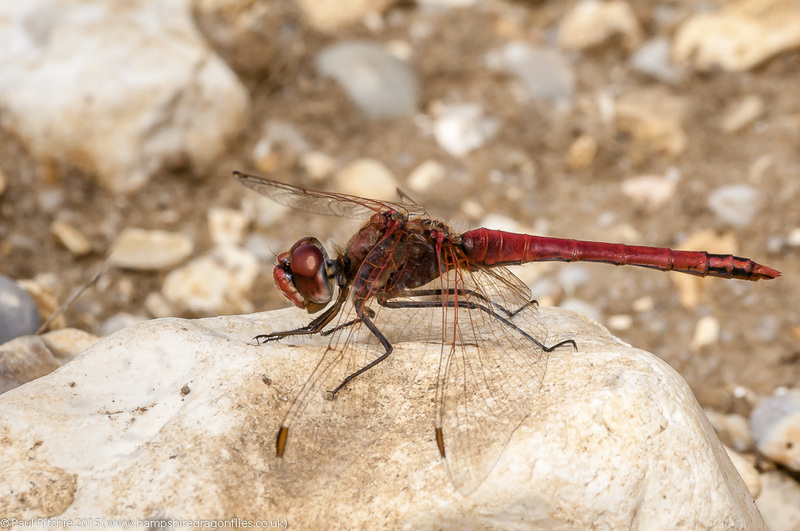 However it was on my way out that I came across a male Red-veined Darter basking on the last fishing stand, rising a couple of times at my presence before disappearing for good. 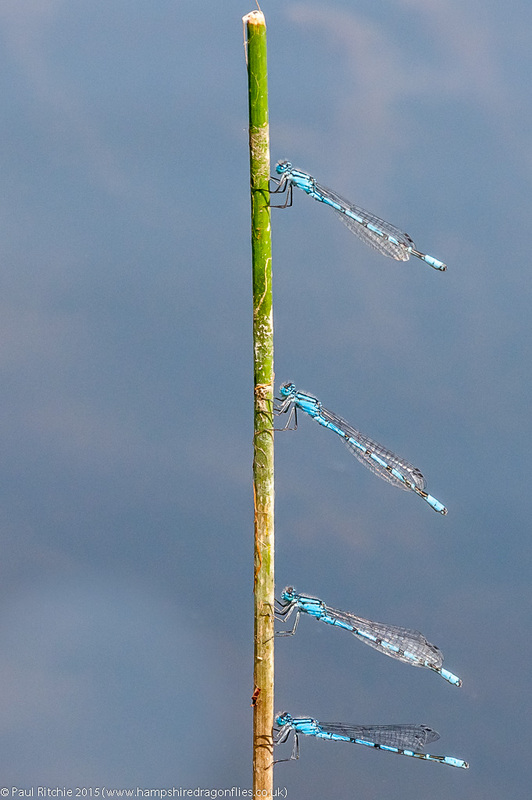 Three Darters then to rescue the day, and right at the end of what turned out to be very hard work! No-one – least of all the met office – knows what the weather is doing at the moment; only that it’s doing it consistently. The promise of some sunny spells was enough to get me out there, disregarding the fact I’d totally failed to factor in the wind. Or maybe I didn’t care? Of course in a breeze like this there wasn’t going to be much going on, but there was enough along Ober Water to make the walk enjoyable. I didn’t see any Scarce Blue-tailed today, but they don’t like it too breezy. Only a few Southern, and a fair scattering of White-legged skirting the bank low down and sheltered. 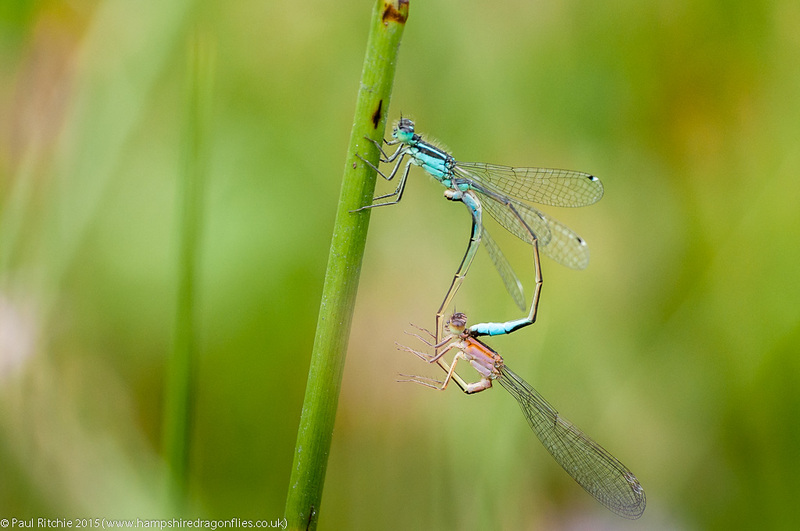 The Beautiful Demoiselles weren’t bothered; more concerned with battling it out for females. 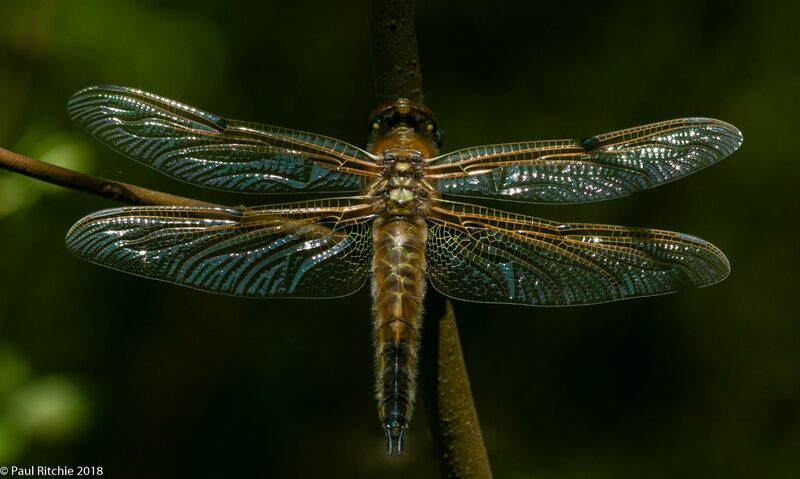 So too were the reasonable number of Keeled Skimmer. One nice surprise today was they dazzling flash of a passing Kingfisher – the first I’ve personally seen along here, although it’s highly likely I’ve missed plenty! The flush leading up to Rhinefield wasn’t as populated as my last visit; no doubt due to the majority being dry, leaving just a few boggy sections which were easy to navigate. 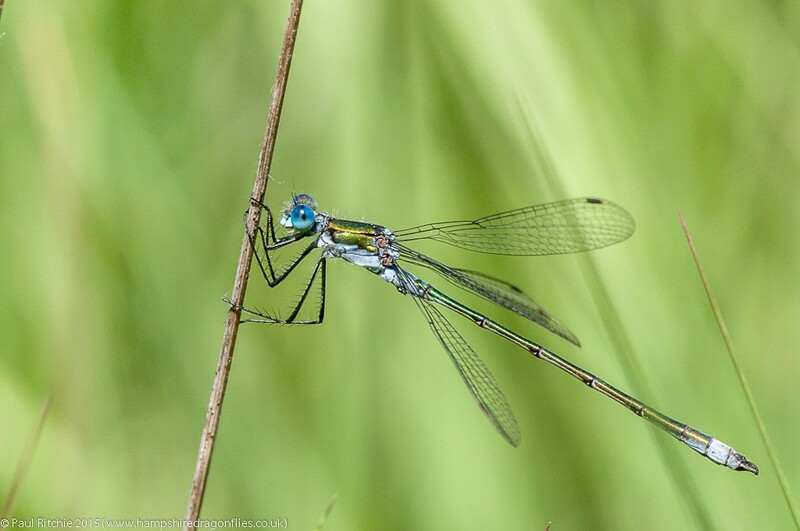 Back through the grasses to the stream and even here the damsels were few & far between. At least the Small Red were still showing good numbers at the foot of the bog. 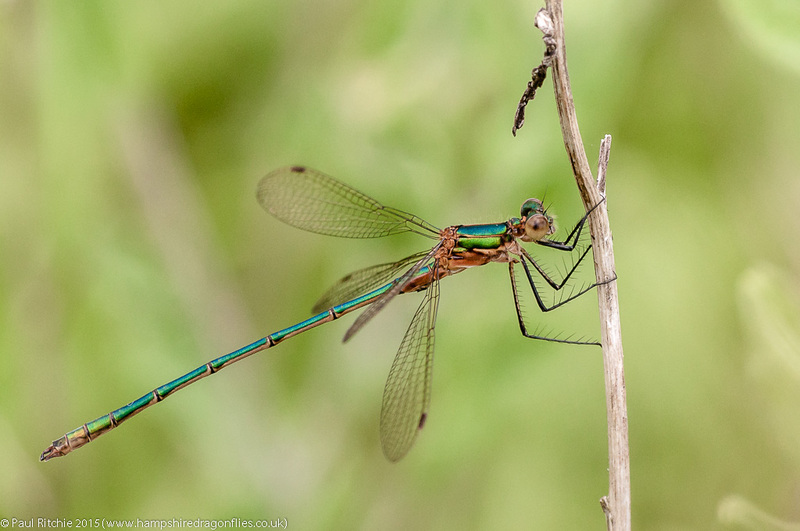 Just the two male Keeled Skimmers and just one male Beautiful Demoiselles along this usually busy small stretch. Continuing my quest to delve a little deeper, the dry conditions allowed me to navigate along the other shore where a sheltered and shady section revealed my first patrolling Golden-ringed, while back at the reed bed I had my second, this one a little more obliging. 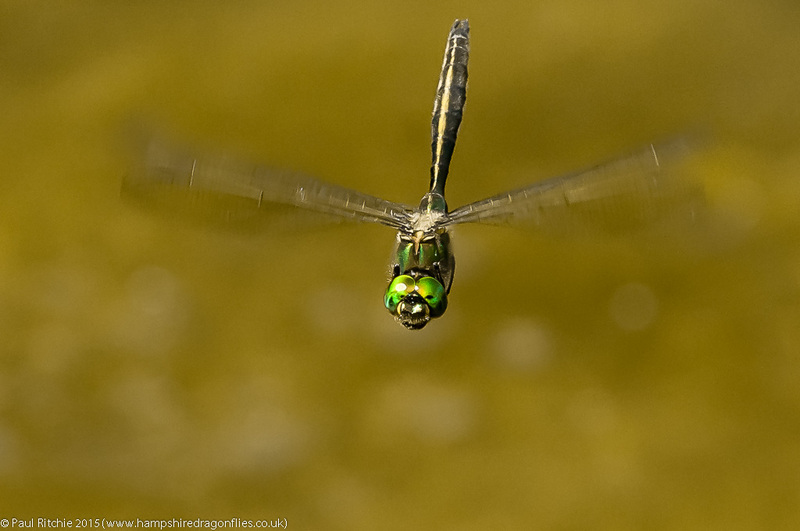 I saw one more briefly back upstream before sitting down for a while to attempt one of the patrolling Keeled Skimmers. Not the best day at Ober Water then, but there’s rarely a day I come home disappointed from what is always a wonderful stroll to take whenever the weather can’t quite make up it’s mind. 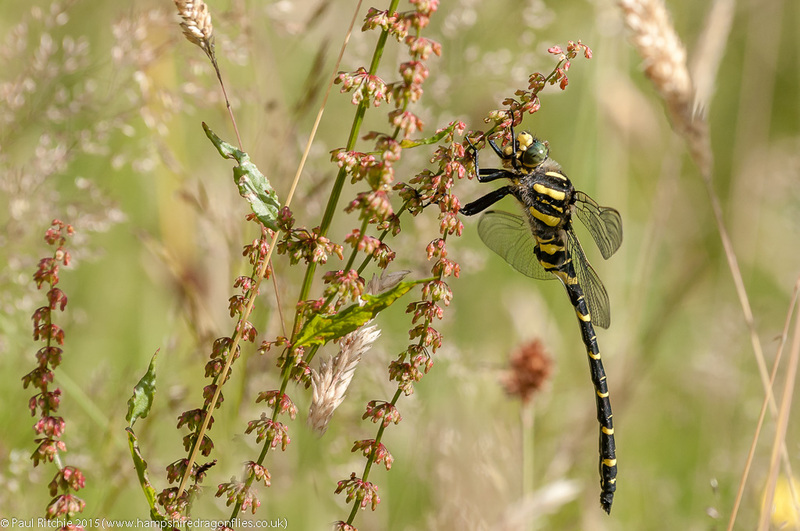 We returned to Swanwick for a couple of hours on Sunday; hoping to grab some more Southern Hawker sightings, but any photo opportunities would be better than nothing. Despite being warmer, it was a little more subdued than Saturday. 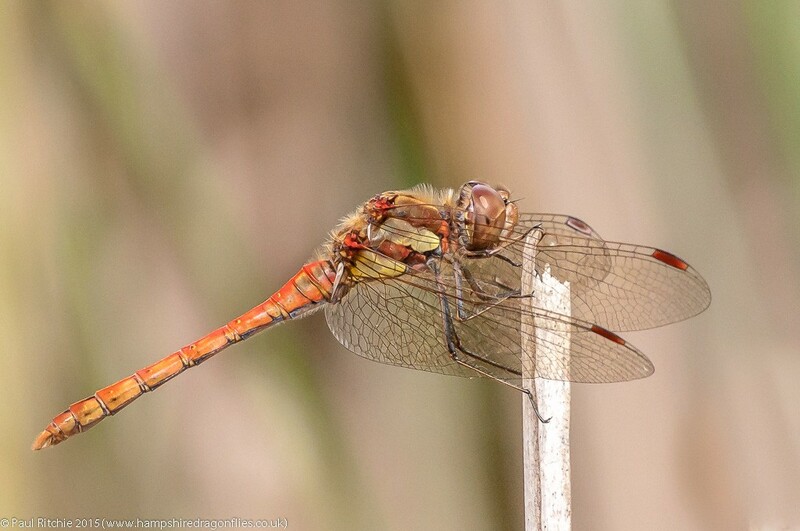 Still not much on the dipping pond, but the centre lake had a Common Darter holding court at the goose clearing. Tom’s Lake had an Emperor and a few Black-tailed Skimmers patrolling the Lily Pads right out in the middle, and the grassy area was still lacking the usual numbers of Blue-tailed, but I couldn’t wait to get to the quadrant, where – true to form – there were a couple of female and a male Emperor hawking the grasses. Just watching them was worth the trip alone; majestically gliding low along the tops of the grasses, picking off tasty morsels on the wing and perching when they chose the larger portions. A stroll to the meadows revealed more Emperor rising from the grasses, disturbed by my passing. 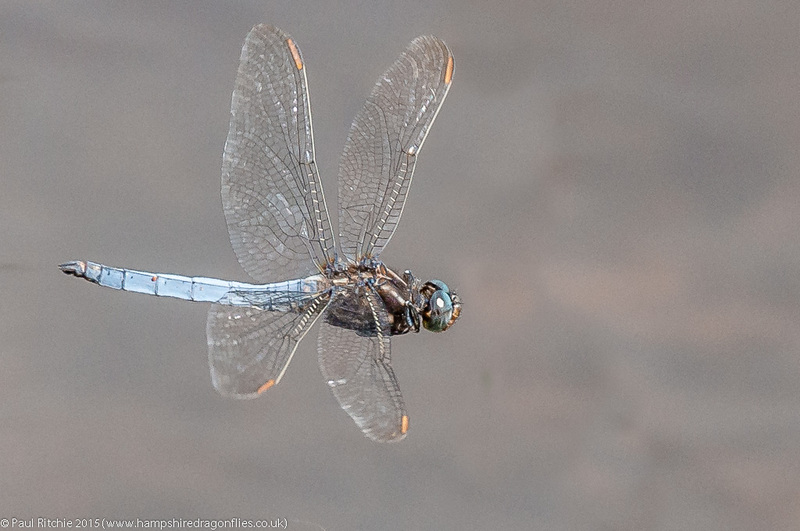 The dog pond still had those tatty Broad-bodied Chasers, but the quadrant had the best pickings. Those Emperors were a joy though. Fond as I am to watch their magnificent acrobatics over water, a meadow offers a different view. You can get among them, marvel as they slowly approach you, circle you, race towards their prey with exceptional acceleration, and test your stealth as you seek out their perch. We didn’t encounter any Southern Hawkers today, but we didn’t really care. We had everything we needed right here. When your (once) favourite pond is dry, and weather & time doesn’t warrant a long journey, a local meadow can provide all you really need. Due to the recent weather I’ve been robbed of the opportunity to venture east in search of scarcities and rarities, so instead I pottered around a couple of local nature reserves. 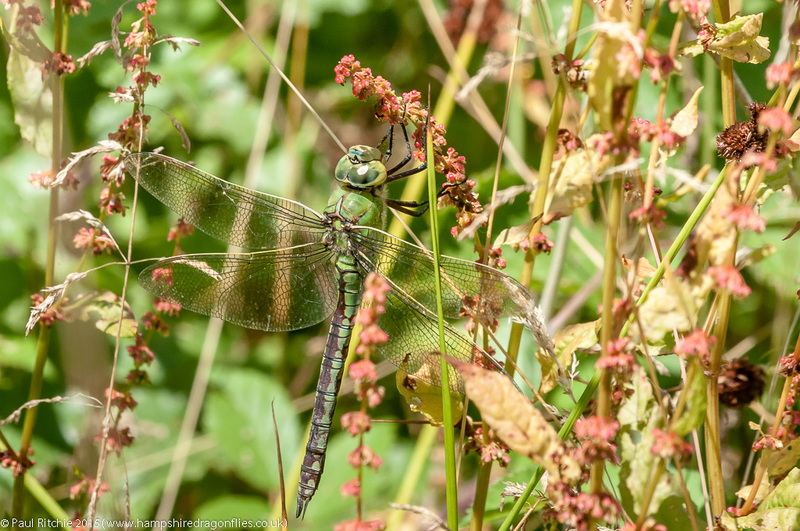 On a pleasant Thursday I took the long walk around Blashford, and besides good showings of Brown Hawker, Emperor and a female Southern Hawker, I came home with nothing worth sharing. So to Saturday and an afternoon stroll around Swanwick; expecting nothing, but loathe to let any glimpse of summer go to waste. As it was it turned out to be rather enjoyable. 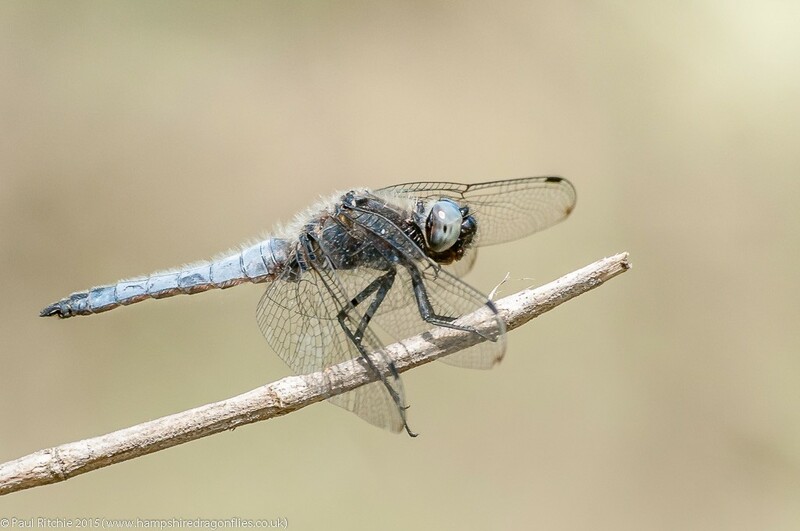 Around the dipping pond there were a few Blue-tailed, Red-eyed and Common Blue damsels with brief visits from Common and Ruddy Darter, Black-tailed Skimmer and a male Emperor who chose the whole area as his territory. Over on the hill another Emperor was hawking magnificently and at Tom’s Pond the small meadow provided some welcome photo opportunities. This violacea female led me a merry chase until she found a pleasing spot. 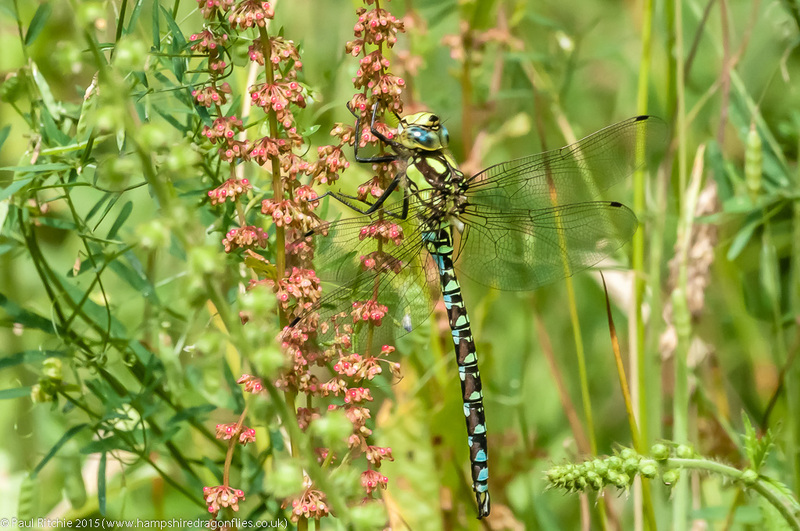 My favourite little quadrant had a male and female Emperor hawking, and Sue spotted a male Southern Hawker who gave me just the one chance to grab a shot. At the dog pond a couple of Broad-bodied Chasers, long past their prime, were battling continuously over their murky brown puddle. Appearances didn’t matter to a female Southern Hawker, who circled the pond several times, stopping frequently to oviposit either in the muddy bank, a discarded log and even my right boot! Try as I might I couldn’t pin her down for other than a record shot, so I continued back through the top meadow, stopping briefly to grab a shot of one of those tatty BBC’s. 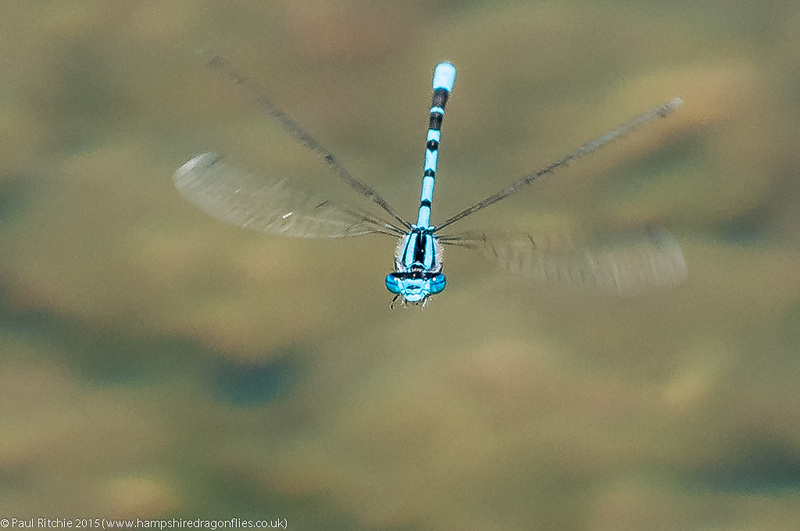 Back at the quadrant there was no further sign of the male Southern, but an Emperor led me on a fruitless chase. Instead I concentrated on a pair of Blue-tailed swaying in the breeze. Once again the best activity and opportunities were away from water in verdant meadows, host to plenty of feeder insects. On Saturday they were chopping trees. Let’s hope they don’t destroy these meadows ahead of time again this year. I try to avoid going anywhere on a Friday. all day rush hours are not my thing. To miss such a perfect day though would have nagged at me all weekend, so I decided to have a stroll around Town Common and Ramsdown. The charming Carol Kirkwood had promised sunny skies and ‘light’ winds, but this wasn’t the case on the Common. Any breeze is exaggerated near the coast, and strengthened by funneling up the Avon and over the unsheltered plain. 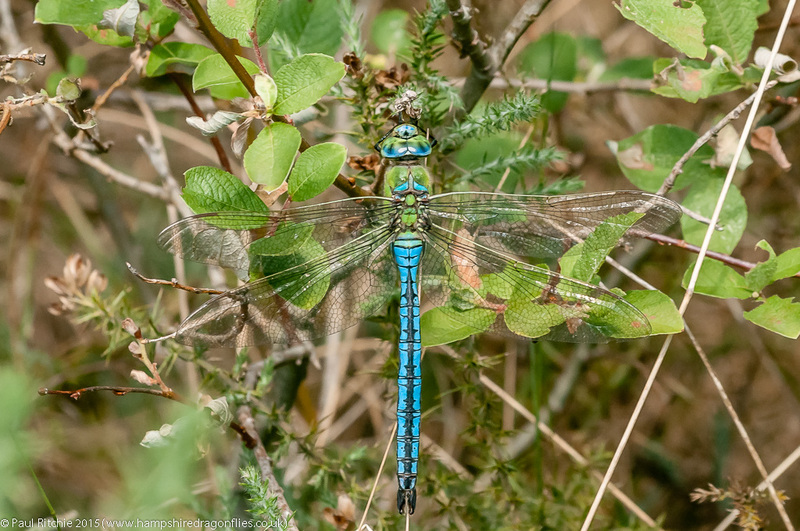 I checked along the margins for any perching hawkers, but a little too early to bring forth any prizes, so I crossed the heath to the ponds where there were a fine showing of Black Darters, Small Red and Emerald Damselflies. Nearly all of the shallow, peaty ponds favoured by the triumvirate are barely more than puddles, but this doesn’t deter their hosts. Even the pool at the far end of the heath is thriving, despite being well within the catchment area of the recent fire. 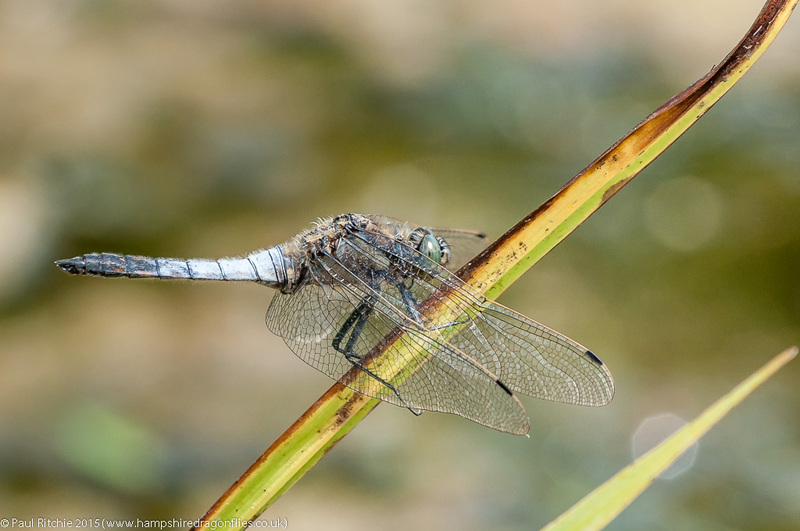 There is one deeper pond which retains water in dry times, and this is where most of the over-water action can be observed; with Emperor, Four-spotted Chaser and Common Darter patrolling. 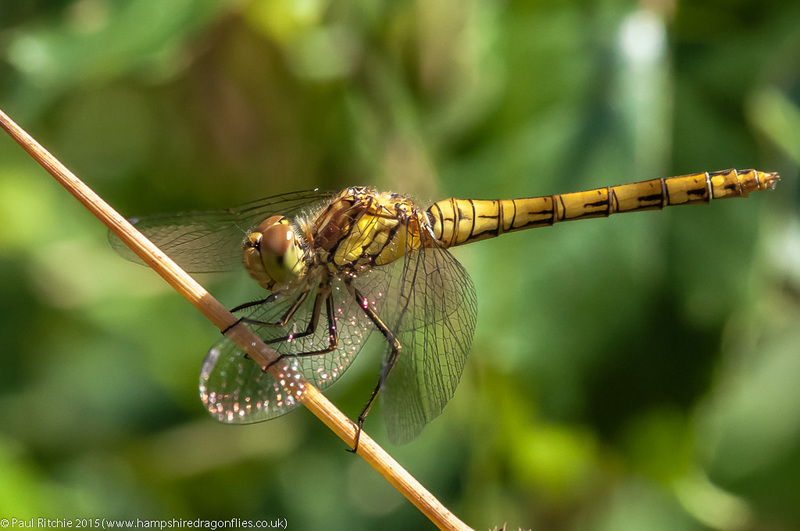 After a comprehensive search of the common I crossed the dual carriageway to Ramsdown, but excepting the deep pool there wasn’t much (else) to be seen, although I did disturb a Brown Hawker in the clearing. I decided to have another visit to the pond near Ringwood. 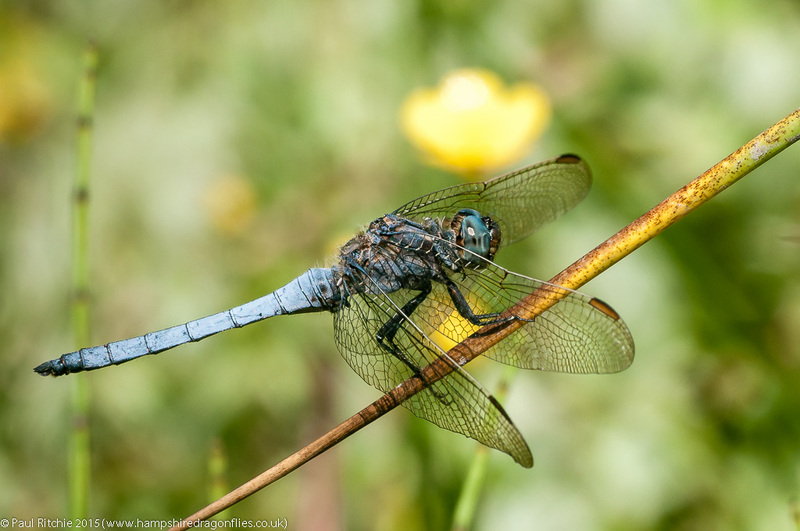 The reeds were still buzzing with Blue-tailed and Common Blue, and a fine population of Black-tailed Skimmers entertained at the shore. Just the one Brown Hawker ephemerally present over water. Still too early for their peak, where any attempts at in-flighters will be better provided for. Time for another visit to the Avon, this time with Doug in tow. Despite a fabulous, if breezy, day and the presence of three or four Brown Hawkers intermittently showing themselves, photo opportunities were very few – unless you wanted Banded Demoiselles, of which there were plenty. In fact the only real opportunity we had was an obliging male Scarce Chaser. After 3 hours of waiting we decided to call in to Troublefield, which if nothing else gave us further proof that today was one of those seemingly perfect days which are sorely lacking. 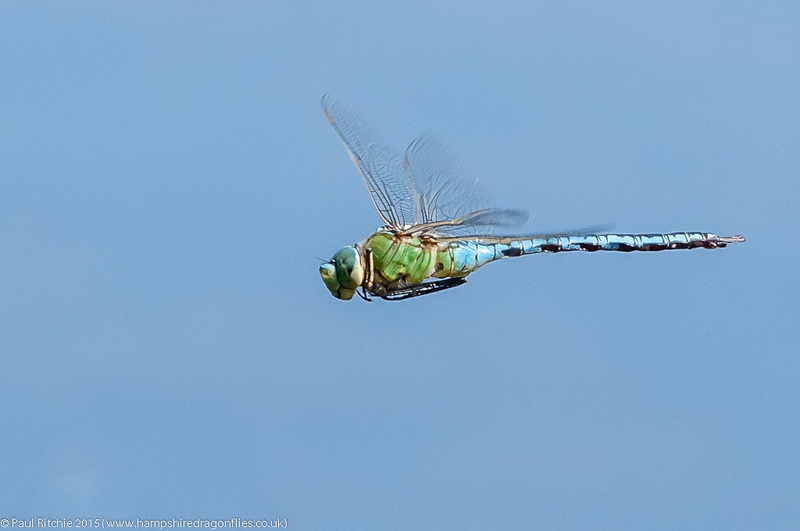 I’m convinced dragonflies sense the impending low and bed down. There can be no other explanation for such a sad showing on what should have been a perfect dragonfly day. I must thank Sue for dragging me out of bed on what should have been another lousy weather day. As it was the sun was shining through the bedroom curtains and I checked the weather for the rest of the day. As I thought in the New Forest, but a glance to the north of the county revealed Bramshill Common was going to be a certainty. Arriving just after 10.30am my first encounter turned out to be the highlight of the day. 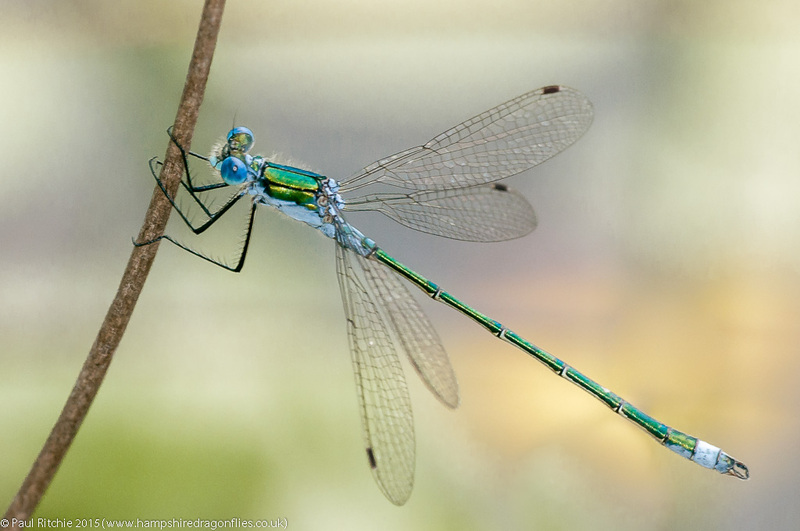 A pristine male Brilliant Emerald offering superb and prolonged views for my pleasure. 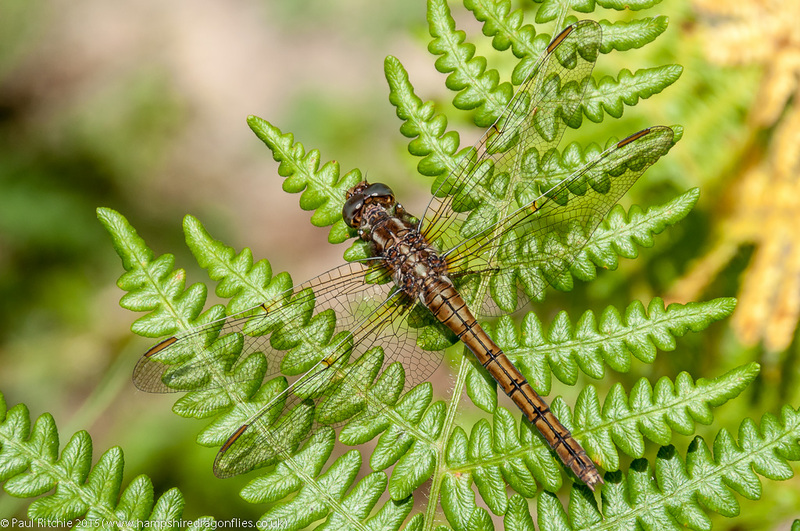 We shared an hour before moving on to the clearing where I stirred up a couple of Brown Hawkers, several Emperors, even more Common Darters and (the inevitable) Black-tailed Skimmers. Taking a walk along one of the rides I encountered my first Southern Hawker of the season. Unfortunately in true female habit, she headed for the safety of a tree. Further along the ride at a crossroads is another delightful little clearing where Emperors often bed down. 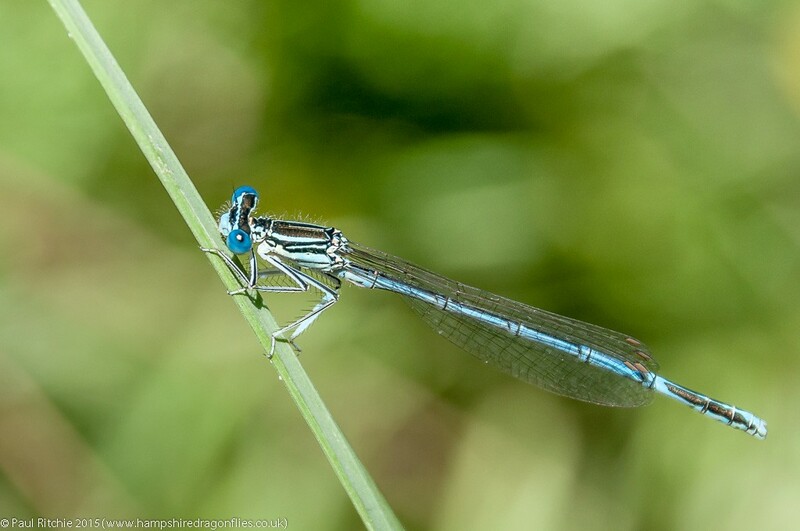 Back at the shore of Long Lake the damsels were in fine form with several congregations of Common Blue sharing the emergent reeds. 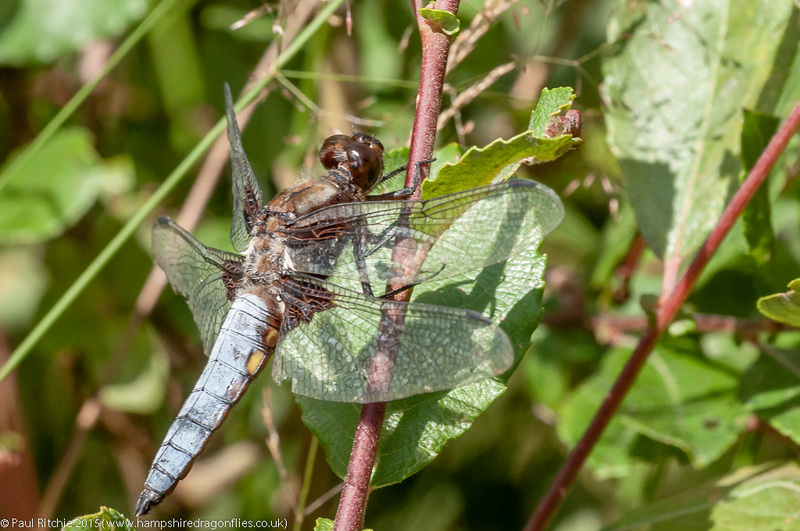 A further tour of the small clearings revealed more Emperor, Black-tailed Skimmers, Four-spotted and Broad Bodied Chasers and several fresh Common Darters. 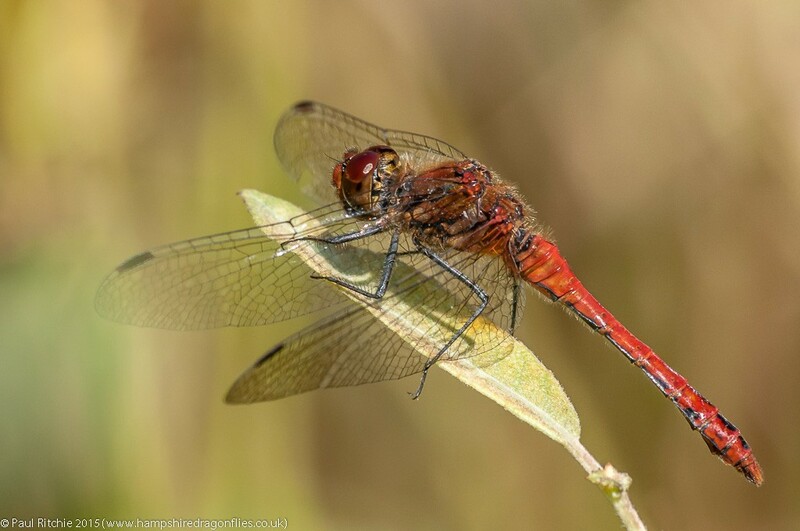 I also had my first ‘red’ male Common Darter sharing space with a patrolling male Emperor. My only slight regret was totally failing to take advantage of a hovering female Brown Hawker, but she only gave me enough time to reach for the camera before she was off and out of sight. Still…a rather productive and thoroughly enjoyable day! A few days to catch up on, and, as we’re due for a period of inclement weather, I’m going to break it down over two or three entries. 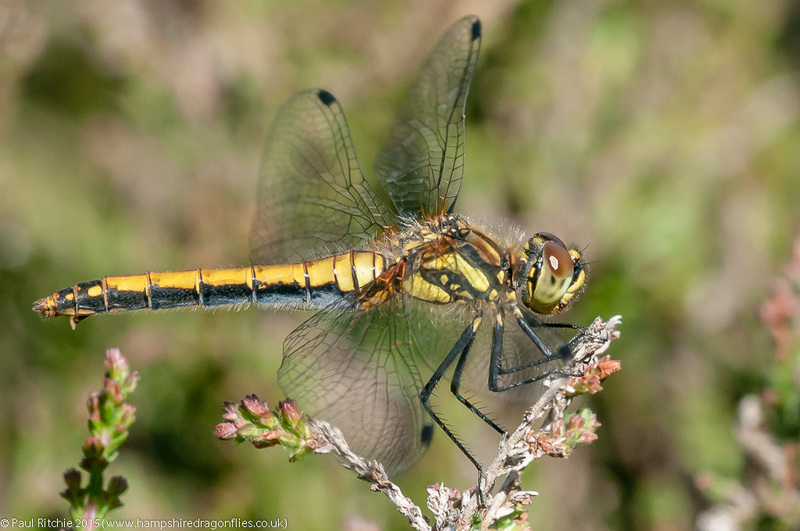 I’ve been hearing several reports about this being a rather lousy season for dragonflies. 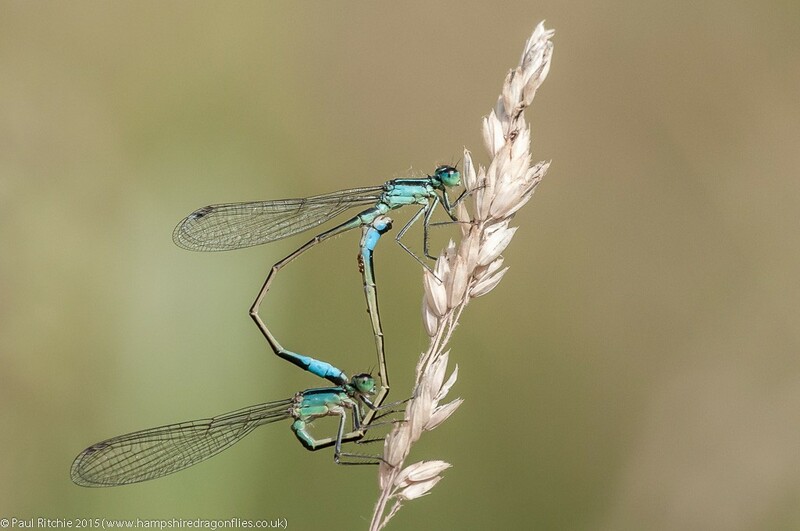 It certainly hasn’t been wonderful for damselflies, with populations down across the board and the usual swarms at key sites sadly lacking. 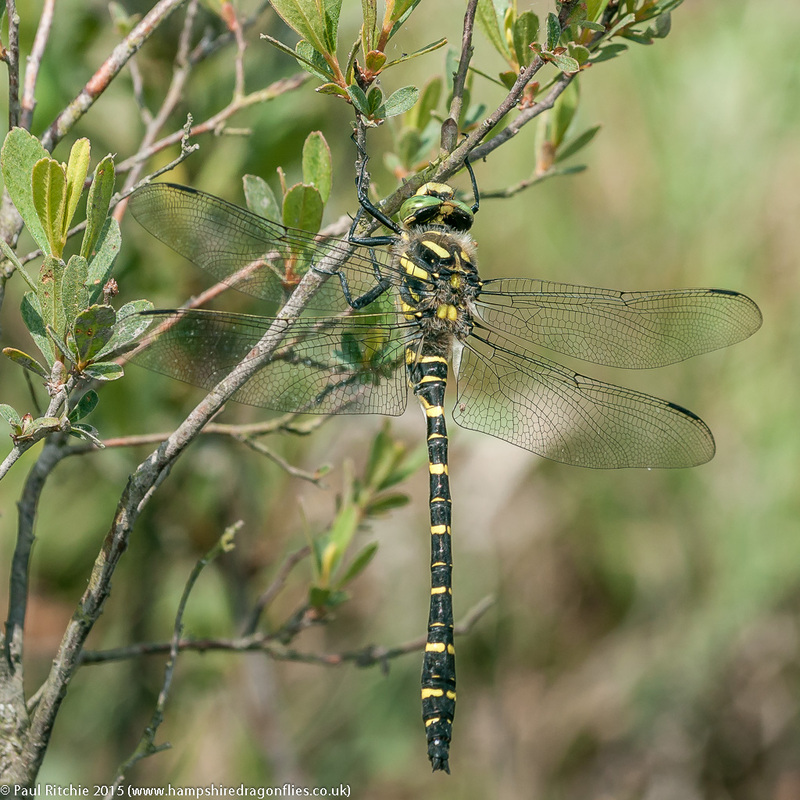 The spring stalwarts, Broad-bodied and Four-spotted have also been thin on the ground (or in the air if you like). However it has been a great season for some of our other species. The Hairy appeared to be doing well on the Somerset Levels and numbers seem normal at other key sites except Pennington, which has been going downhill in recent years. The Emperor has had a fine season. Numbers way up in my observations. 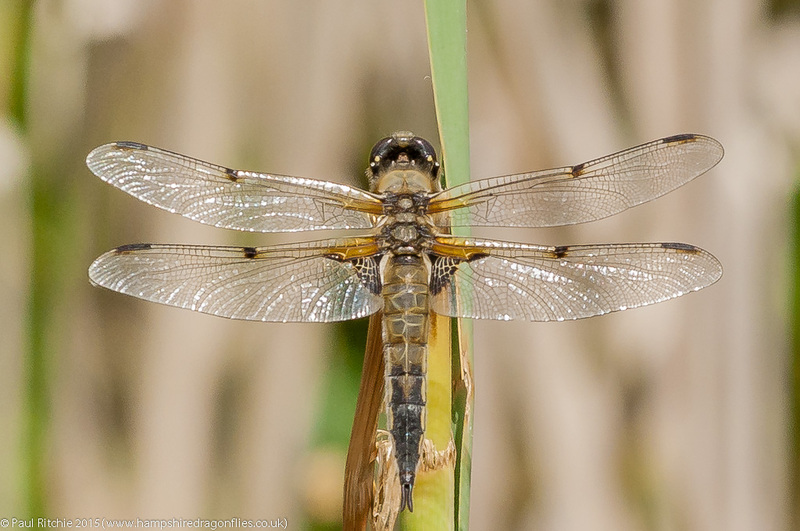 Likewise the Scarce Chaser and Black-tailed Skimmer. A little too early perhaps to document the Golden-ringed, a benchmark is Crockford where their peak has yet to happen. The same with the Brown Hawker. Way too early to quantify. So back to Swanwick. In an unusual step I took the bus; something I doubt I will be doing again. I’d rather walk and spend the equivalent of the price of a pint on a pint. My reason I took the bus is it hadn’t promised to be a particular fine day, but a brighter afternoon had me curious. 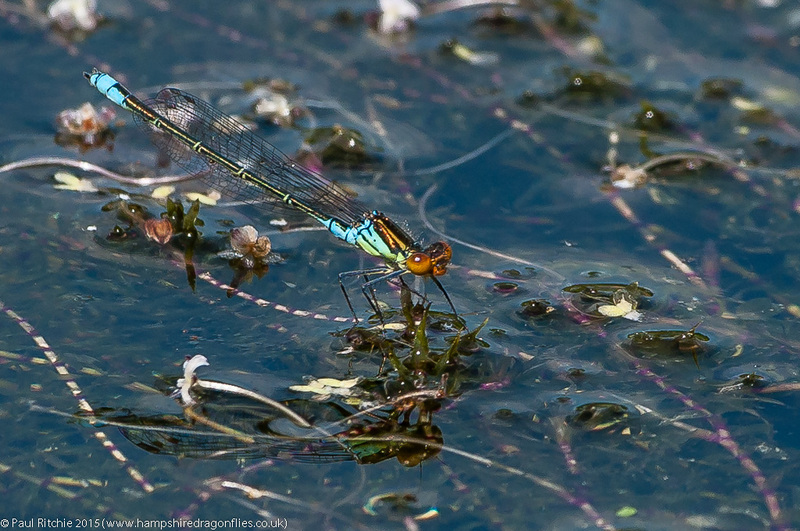 No Small Red-eyed (yet) around the dipping pond; just a few Common Blue, Azure, Red-eyed and Blue-tailed. The grassy area was sadly lacking due to the overgrowth – a problem quite easily overcome by razing a path or two through to offer decent vantage points for perching odos. They need these clear sections to both hunt for prey and have a good route to escape predators. 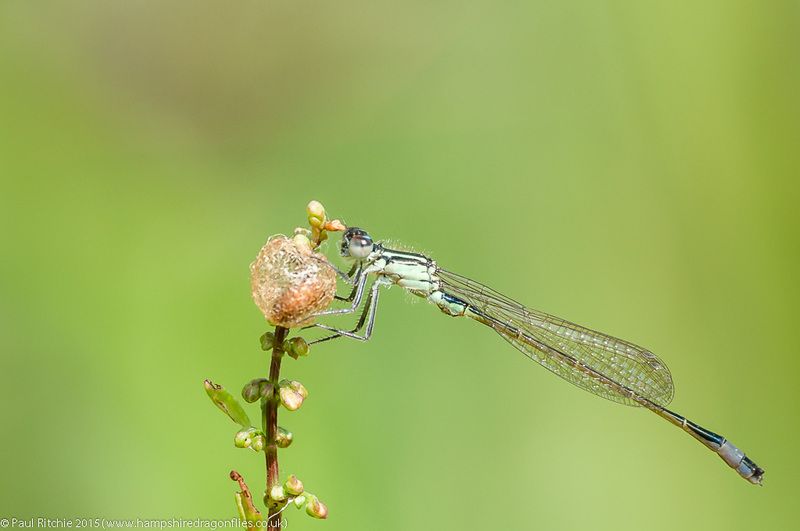 In common with many water bodies this summer, the stream was completely dry, and the surrounding foliage was also overgrown with no clear sections, but a few damsels were present around the margins. 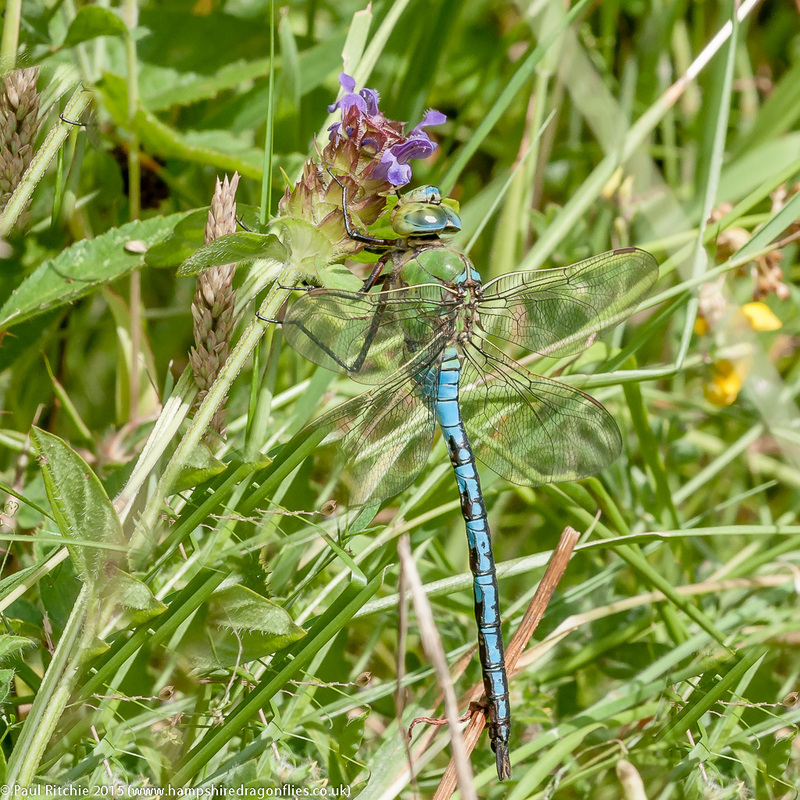 My favourite little meadow had a young Common Darter and an Emperor content to hide within some deep cover, making for a technically-lousy shot, yet offering a sense of meadow realism. 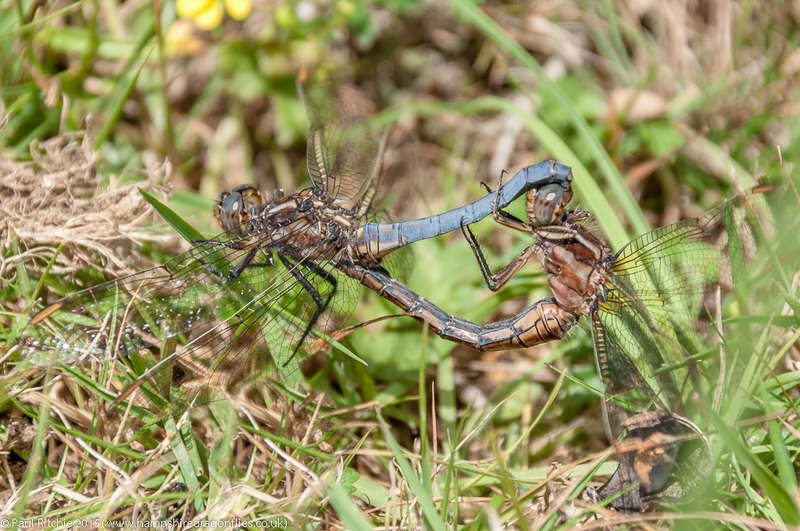 The ‘dog pond’ at least had a few Broad-bodied Chasers present; two males battling over a female in what is presently just a muddy puddle. I decided to have a walk around the furthest reaches of the meadow, the best area orchard-like with a few well positioned small trees to break up the landscape. The only problem with this lovely little micro-climate were the hoards of horseflies which were ravenous for me today. I suffered six nasty bites during my quest for a present Golden-ringed. Worth the bus fare? Maybe. Certainly worth the visit. Sue & I took an afternoon trip to my new favourite pond. This was Sue’s first visit, and despite there being a little less activity than my two previous visits, she definitely approved of the sheer diversity today. Not just the expected dragonflies, but a fine selection of woodland and meadow butterflies. Silver-washed Fritillary, White Admiral, Ringlet, Speckled Wood, Peacock, Small Tortoiseshell, Comma, Large, Small and Essex Skipper, Meadow Brown. Common Blue, Marbled White, Large White and Small White. That’s fifteen species of butterfly alone! The resident Emperors were certainly loving it; hawking over the field or catching Marbled White on the wing, especially if they were foolish enough to fly over the pond. No Downy today, but the sight of Common Emeralds among the resident Large Red, Blue-tailed, Common Blue and Azure made up for this. 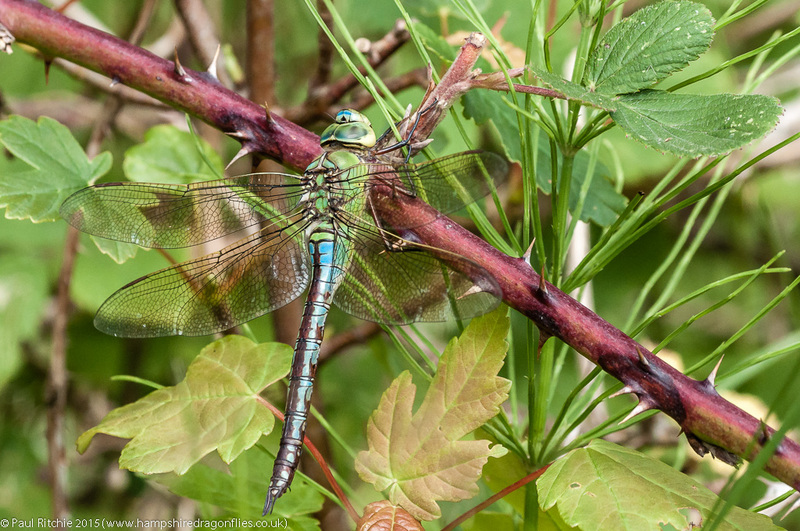 The only other larger species present were Four-spotted and Broad-bodied Chasers. 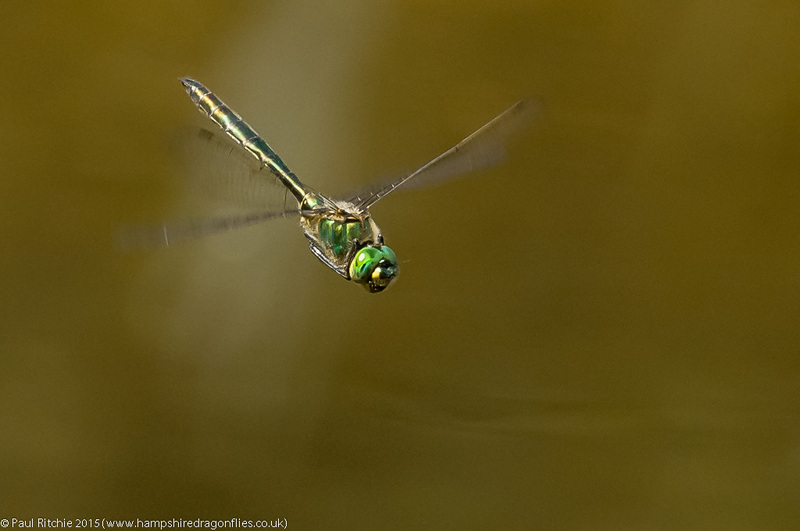 At least six male Emperor were present over the pond. There were also at least four females, which made for some very interesting battles. Male-on-male, sometimes up to four at a time, and female on male. No successful pairings witnessed today! Doug had messaged the day before asking if I wanted to join him and his son, Charlie, at Crockford with someone who was eager to see a Golden-ringed, but a last minute bail-out by the interested party changed the venue to a ‘new’ pond near Ringwood. 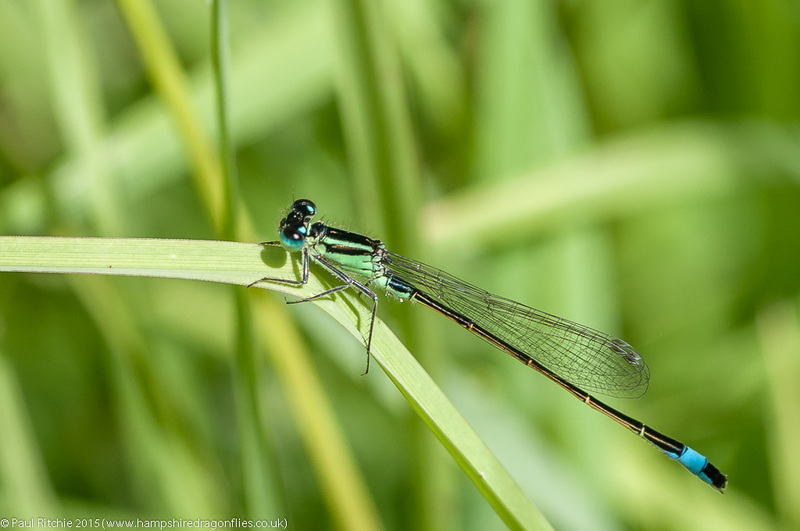 Always happy to visit a new site, we met just after lunch and explored the heavily-reeded margins for perching damsels. A cracking display of Blue-tailed; more than I’ve seen anywhere else this season. Plenty of Banded Demoiselles too. Not surprising considering the close proximity of the River Avon. Over at the shore I had my first Brown Hawkers of the season. Unfortunately the weather wasn’t optimum for their wonderful flying displays; just a couple seen sporadically. 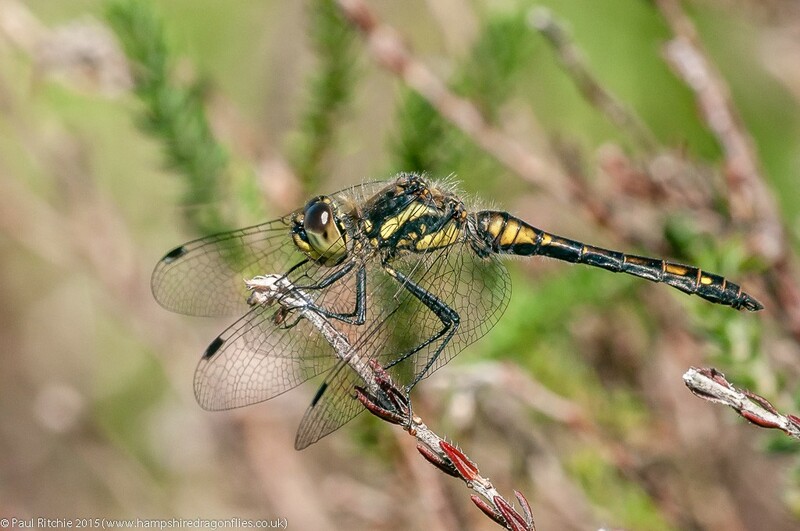 There was also a large population of Black-tailed Skimmers, a couple of Emperors and some Four-spotted Chasers. Certainly a place for further exploration on a better day. 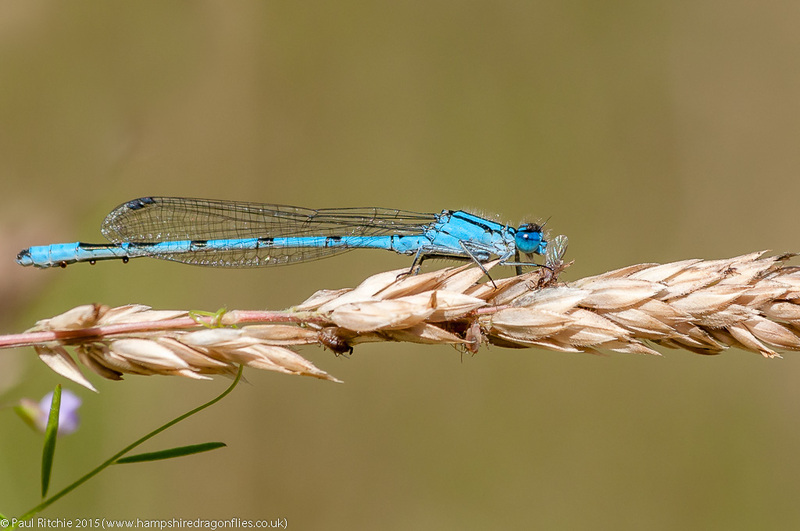 We decided to have a look at Blashford Lakes, concentrating on the corner of Ellingham Pound, where once again the Emperor were in fine fettle, supported by a large cast of Common Blue damselflies and a few Red-eyed. 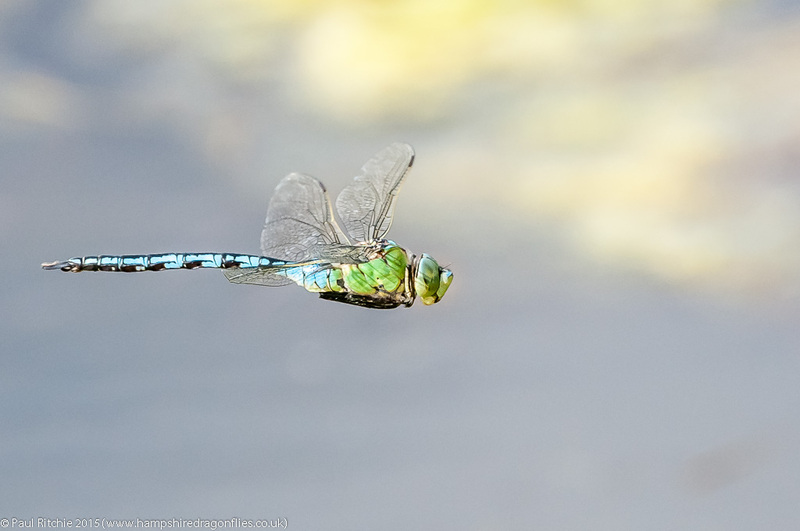 Doug thought he’d have a go at in-flight damsels, and as I’ve taken far too many Emperors this season, it seemed like a nice change. Still couldn’t resist those Emperor though. Ellingham Pound is a man-made, steep pebble-bordered lake in which odo activity is mainly centered around the vegetated corners, but a walk along the causeway path at this time of year is a wonder, with teneral Common Blue and Blue tailed-damsels and Black-tailed Skimmers rising in clouds; perhaps giving rise to the legend of fairies. 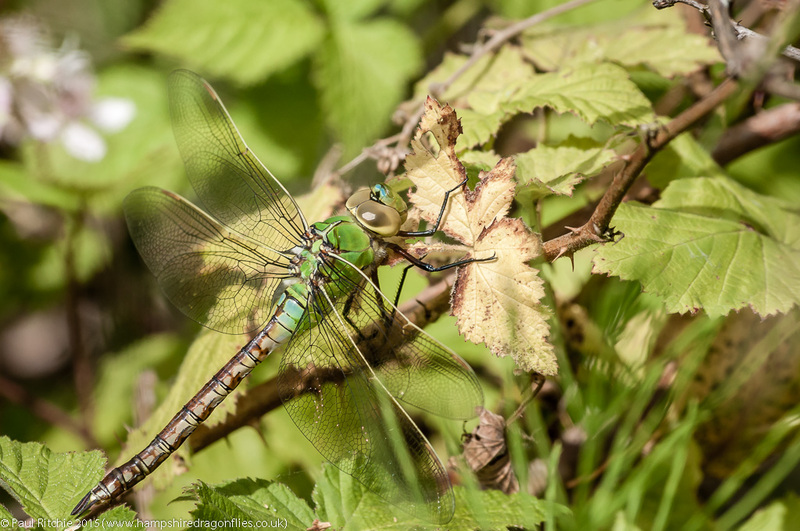 On the way out we noticed a female Emperor hawking over a stand of brambles. When she landed we stealthily headed over for a shot or two. Charlie pointed out another which we had failed to see perched about a meter away in the same bush. Keen, young and fresh eyes are obviously an advantage to seasoned old gits like us who tend to use tunnel vision to focus on one subject, but it just goes to show it’s worth widening your vision. 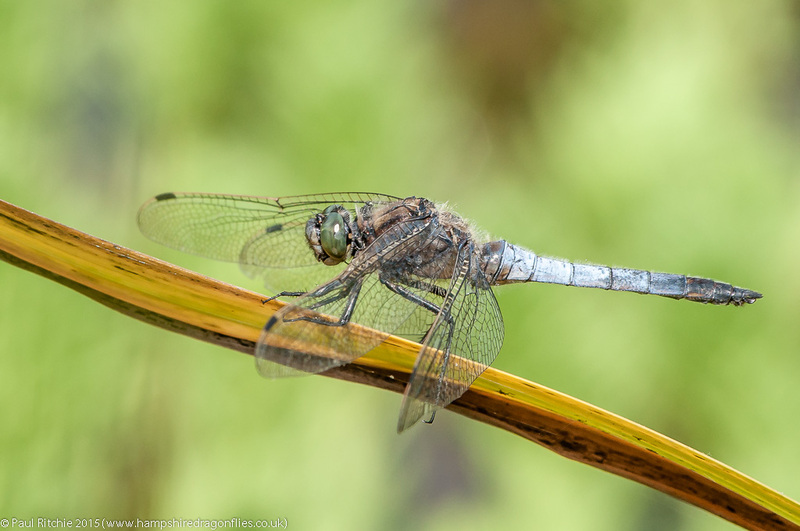 On Tuesday I planned to meet up with Steve Covey to hopefully find him an aurantiaca female Scarce Blue-tailed. Sue had taken the day off, and Neil Phillips had expressed an interest, and while we were awaiting Steve we met up with Neil further upstream. Scarce Blue-tailed were already visible along the flushes which still had water, but it was the aurantiaca which was the target today. A finger-tip search of the heather and grass was surprisingly uneventful, until Sue let out a shout. Here was a rather beautiful ‘transitional’ female, the colour of which I’ve not seen before. 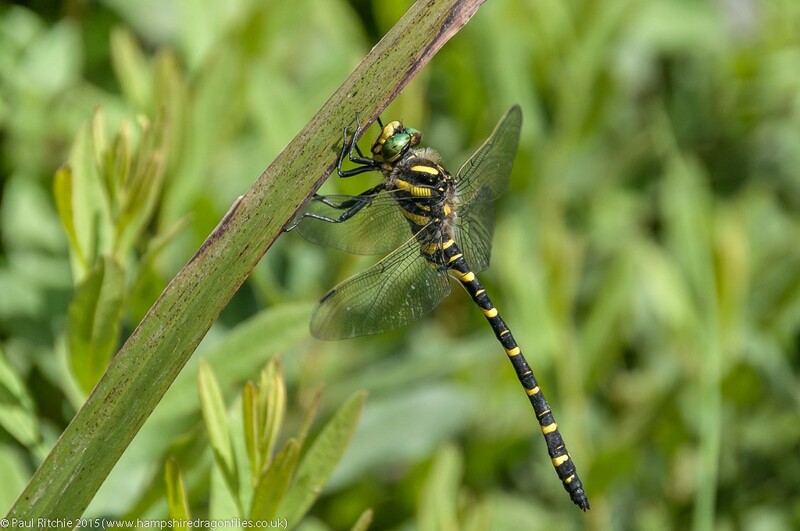 Unfortunately I missed my opportunity to get a photograph, but for the record it resembles the Richard Lewington drawing found in the dragonfly guide books. Here’s a link to Neil’s photo. A quest for Raft Spiders led Neil off to other pastures while the rest of us continued with our search. No aurantiaca to be found, but a few mature females showed themselves. We managed to find quite a few more males, and Steve consoled himself with a mating pair. Other than that it was mainly Small Red, who seem to be thriving everywhere this season. Keeled Skimmers were more abundant than last time and occasionally offered a decent photo opportunity. 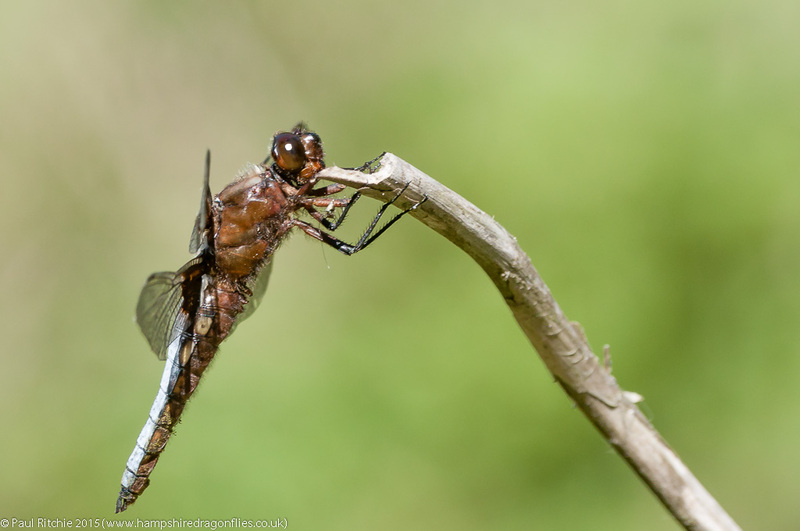 The stream showed a few more Beautiful Demoiselles than of late, and we even had a Golden-ringed towards the end, but it was a Broad-bodied Chaser who gave the last good opportunity of the day. A more productive day than Tuesday, with a visit first to Pennington to connect with the Small Red-eyed. 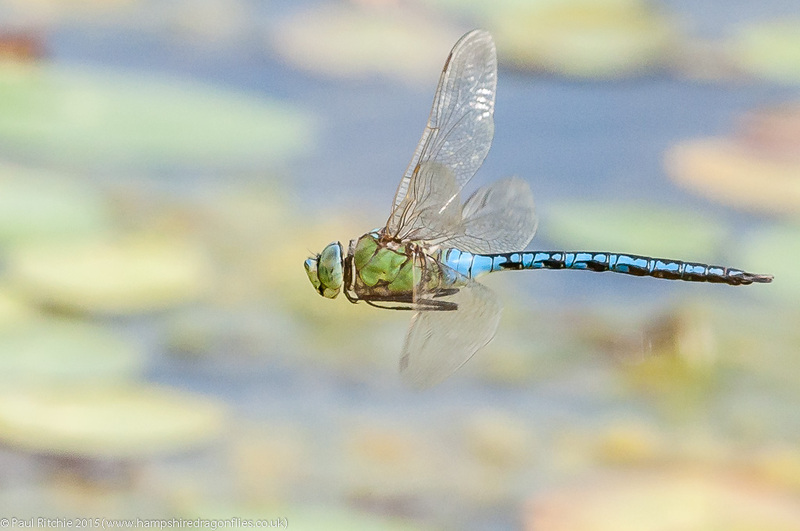 There wasn’t a great deal on the pond; just a male & female Emperor, a tatty Four-spotted Chaser and some Black-tailed Skimmers. 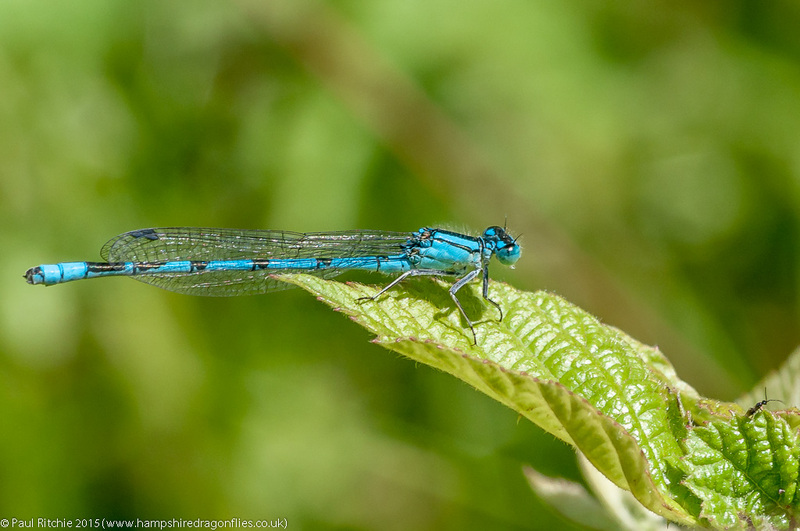 Among the undergrowth were several more damsels, including several pairs of Blue-tailed and Azure. Still not as many Blue-tailed as usual, but it’ hard to resist a good opportunity. 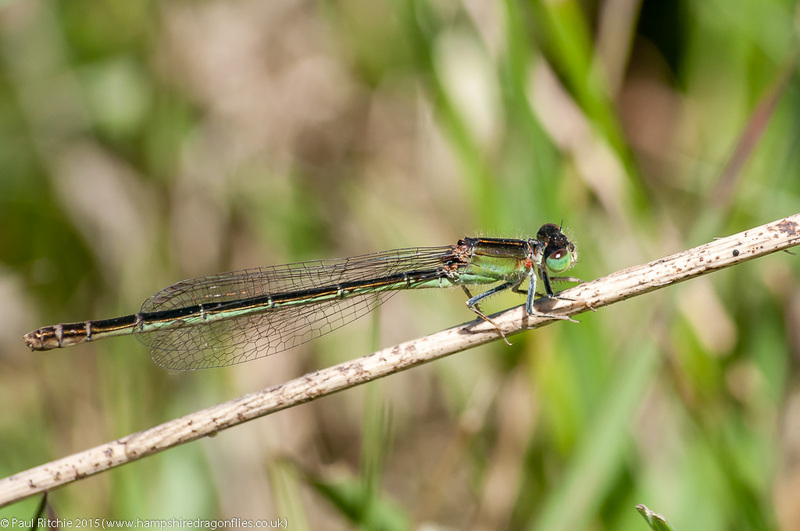 As the only other activity was from fresh Common Darters, I decided to move on to Crockford Stream, where I bumped into Stephen Darlington; a nice surprise. We always seem to meet up somewhere in the field. 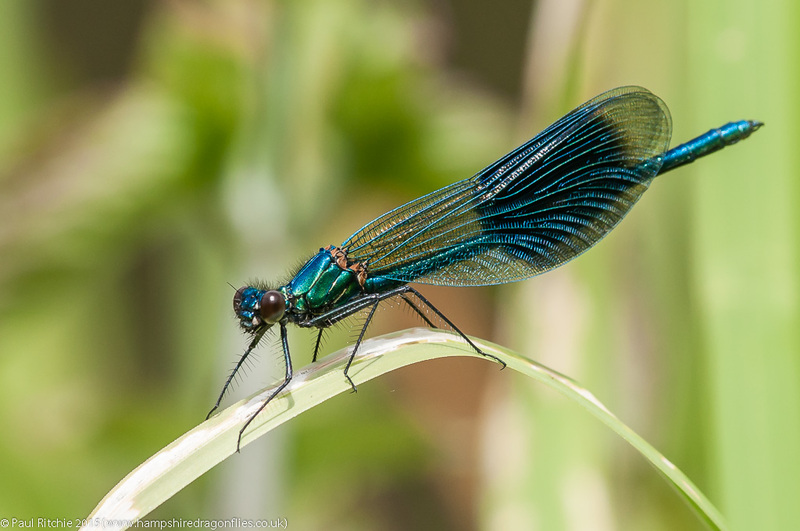 The main basin was surprisingly subdued, with only Beautiful Demoiselles, Keeled Skimmers and just the occasional visit from a Golden-ringed – one who’s territory extended for a good length of the stream. 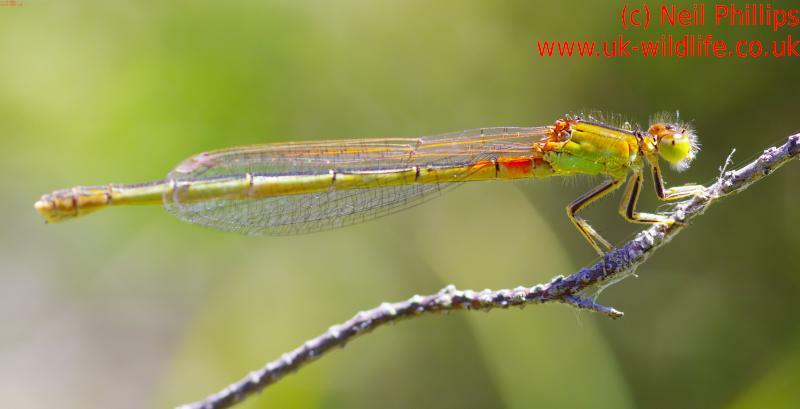 A female Emperor was choosing the pool to oviposit, and the Bog Myrtle was decorated with the usual Southern and Small Red damsels. A little further upstream I found the first willing Golden-ringed. I couldn’t resist the walk upstream to my favourite spot. The walk was punctuated with several more Golden-ringed, Keeled, Southern and Small Red, but the pool at the top didn’t have a patrolling Emperor this time. At least the stream had a resident Golden-ringed which provided the perfect opportunity. Back downstream Stephen was still present, and a Keeled Skimmer was hard to resist against the water’s reflections. Some connoisseurs reject Crockford Stream as too commercial, or popular, but it remains the best place to grab your Golden-ringed opportunities and in fine weather the light is always special. It didn’t earn it’s reputation for nothing! Please note:- The car parks at Crockford are closed until July 31st to prevent dog walkers from disturbing ground nesting birds. However parking is still possible a short distance away at Norley Inclosure.